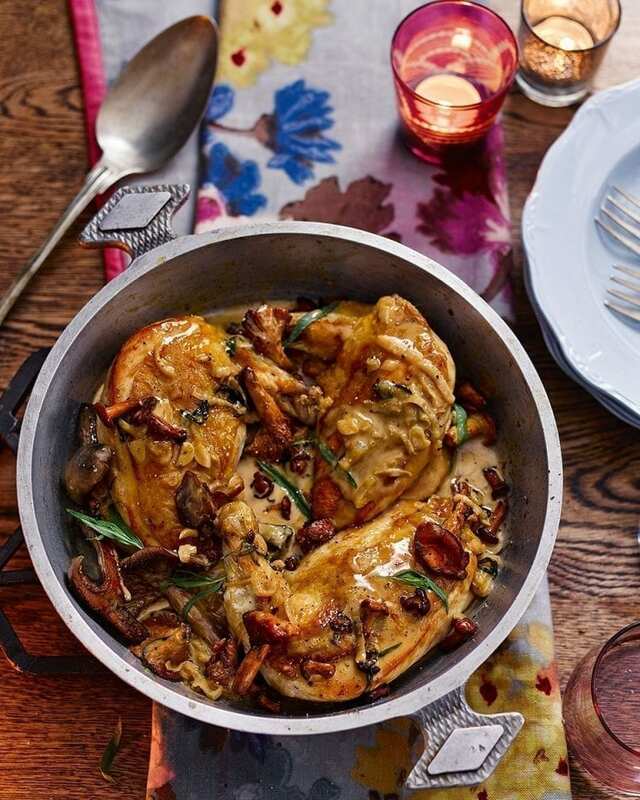 Creamy tarragon sauce pairs perfectly with succulent chicken breasts and wild mushrooms in this flavour packed chicken supreme recipe. Heat the oven to 200°C/180°C fan/ gas 6. Heat a glug of oil in a heavy- based frying pan over a high heat, and cook the chicken, skin-side down, for 3-5 minutes until golden. Set the pan aside. Put the chicken in a baking dish skin-side-up and roast for 20-25 minutes until the pieces are cooked through (see tip). Rest the supremes for 5 minutes. Add the butter to the reserved pan and put on the lowest heat. Add the shallots and garlic, then cook for around 7 minutes. Add the chicken stock and white wine, turn up the heat then reduce over a high heat for 15-20 minutes until the taste of alcohol has disappeared. Add the cream and bubble to reduce for about 3 minutes more. Meanwhile heat another knob of butter and a glug of oil in a frying pan over a high heat. When foaming, add the mushrooms and cook for 5-8 minutes, tossing occasionally, until dark golden. Add to the sauce with the tarragon, mustard and a squeeze of lemon juice, then taste and season. Pour in any resting juices from the chicken, then serve with the chicken supremes, either spooned over on plates or served at the table on a large platter. We used chicken supremes here (chicken breasts with the fillet and wing bone attached) but good thick chicken breasts are fine. If you’re using smaller ones, reduce the roasting time by 4-5 minutes. It’s worth buying your chicken from a butcher as supermarket breasts can differ in size, giving unevenly cooked chicken. Make the tarragon sauce up to 24 hours ahead, cover and chill. Reheat until piping hot. Pour the juices from the chicken into the hot sauce before serving.